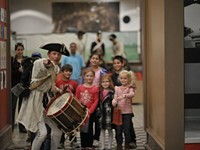 "Talking Continents" is on view through June 9. Lately, our world has been increasingly divisive. “There’s a lot of hateful conversations about nationalism, not only in the U.S. but globally, and the rise of nationalism globally,” says Rachel Reese, Curator of Modern and Contemporary Art at the Jepson Center. Art is one of humanity’s greatest unifiers, and fortunately, the Jepson Center has just what we need. 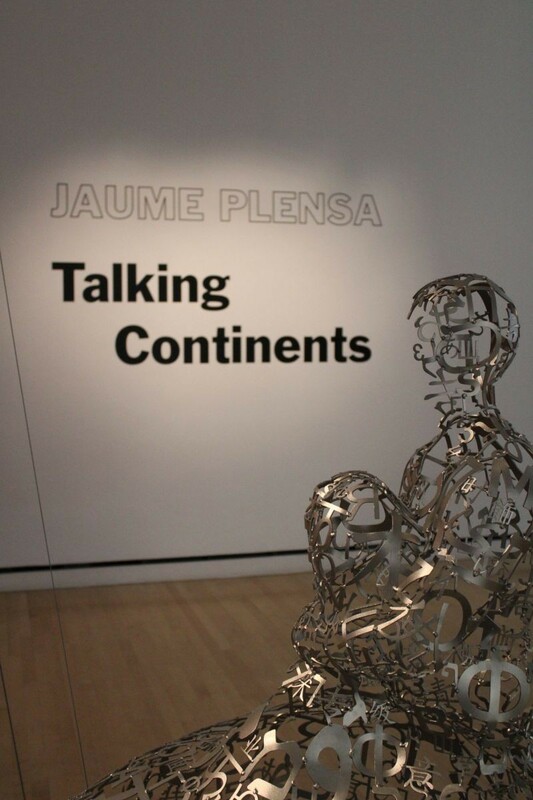 “Talking Continents” by Barcelona-based Jaume Plensa opened at the Jepson on Mar. 1. The installation is purposely simple in its presentation. 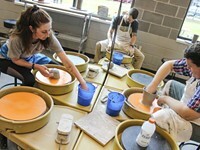 “This is sort of a contemplative space where you can think of things that link us rather than divide us,” Reese says. Reese notes that Plensa’s installation is typically set against dark painted walls, but the Jepson’s installation used light walls instead. The resulting effect is an ethereally beautiful space that invites reflection. 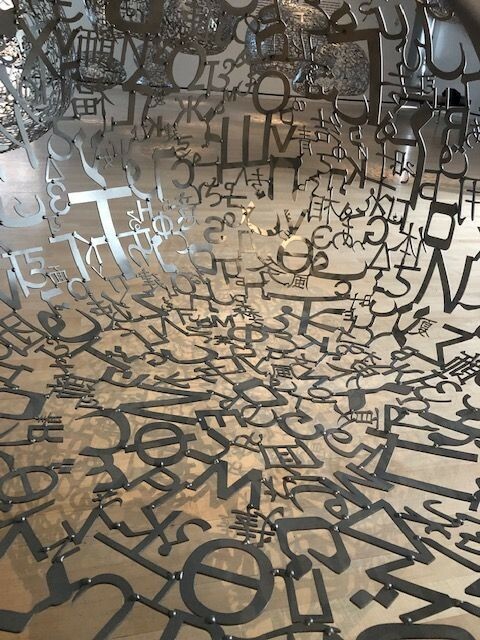 Nineteen stainless steel figures, suspended by wires, are comprised of letters from eight different alphabets. It’s not hard to see the metaphor in the work. Another inspiration for Plensa’s vision of community was music. In “Talking Continents,” there are five floating shapes that are larger than the other ones and have a figure riding them. 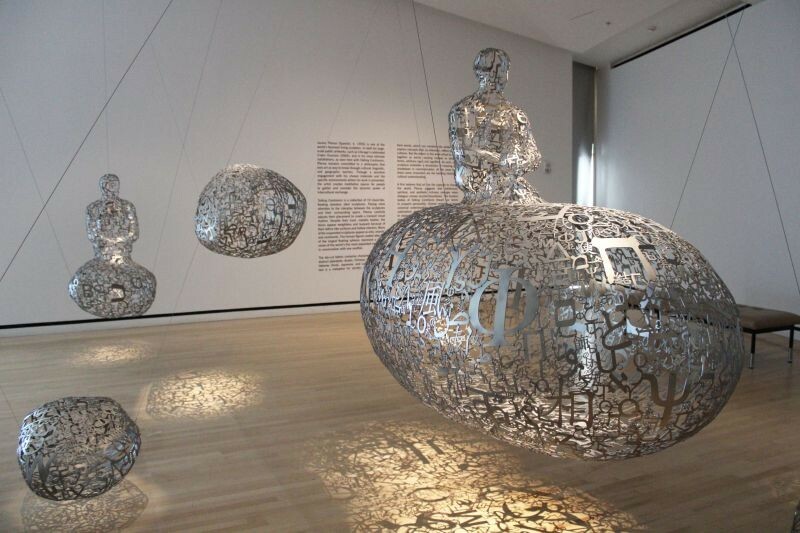 The exhibition continues with Plensa’s other works. In the back room of the gallery is “Laura II,” an extremely large alabaster head weighing over two thousand pounds. Plensa uses data points to map the faces of women and girls and then digitally manipulates the scale before machine carving the figure and hand-finishing it. 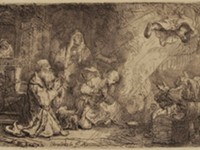 The Telfair also included some graphite [renderings] in the exhibition, and the unifier of these pieces is that each figure’s eyes are closed. The back room where “Aurora II” is housed is perfect for that inner dreaming Plensa hopes to inspire. The lights are dim with one spotlight shining precisely on the figure’s face, creating a sleepy, dreamy feeling.